How do you fit a symphony orchestra onto a playground swing? Stephen Neely argues that it happens every time its musicians play together. 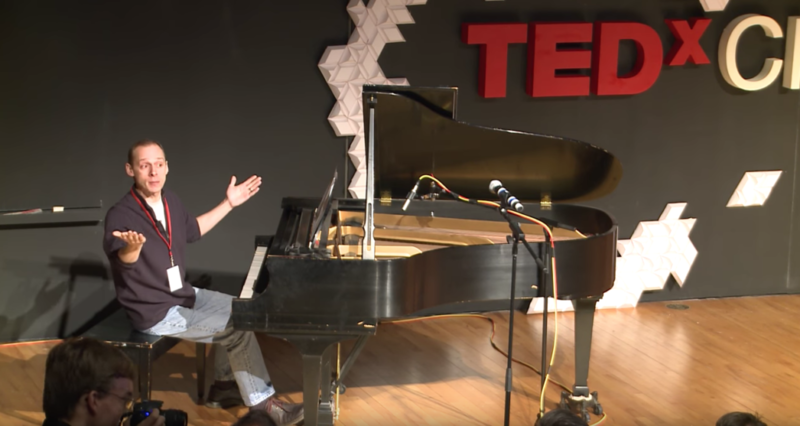 In 2012, Stephen Neely presented at TEDxCMU a talk titled “What moves you?” It’s an overview of what Dalcroze Eurhythmics means to him and why it is important to teach in his undergraduate classes. Specifically, he draws the connection between the interpretation of music and interpretation in our lives in general. Stephen Neely is Assistant Professor of Dalcroze Eurhythmics at Carnegie Mellon University in Pittsburgh, PA. His research focuses on the physical nature of art—that is, the ways in which our physical presence/bodies are necessary components of the arts, far more integrally than the cerebral aspects of performing, creating, or appreciating. He is a conductor of choirs and orchestras, sings with opera companies, and has travelled the world leading workshops and clinics that focus on the “authentic gesture” that is inherent in all of the arts. Music is supposed to feel like something, far more importantly than it ever sound like something. The DSA reflects the richness and diversity of the American community of practice, which includes Dalcroze-inspired teachers & artists, musicians & dancers, and actors & other professionals who have adapted the Dalcroze approach to their individual work. Let us know what Dalcroze means to you. Not a member? Join instantly online. Alex Marthaler is a composer, pianist, and educator in Pittsburgh, PA. He is a pianist for modern dance and ballet classes at Point Park University and Carnegie Mellon University. Alex also teaches children's musical storytelling and improvisation classes.